The history and curiosities of the English language. Language, power and myths of oppression in early Middle English - the "beef or ox" story. What the history of words tells us. How many Englishes are there? Where English doesn't work, and should we fix it? What's "good" English, and how good is it? For KS2 - history and museum-making. A workshop to entice boys into reading fiction and non-fiction. Reading - life or study skill? A workshop on different ways of reading, for Sixth-form Literature students. How a writer approaches research and writing non-fiction. This can be presented with another non-fiction writer, and is directed particularly at boys who prefer reading non-fiction. Site-specific art project, using objects, research and text. This can be made as an installation or map, for KS2 or KS3. For 6th Form or Foundation Art and/or History students. Virtual or planned exhibition, working in a museum, selecting objects, writing text, working out groupings and layouts. Narrative or suggestion; truth or conjecture? What knowledge do you expect them to bring, and to take away? Making a hide, and bird-spotting. Educational work has become part of the mainstream of my work as an artist and writer. Rather than imparting factual information, I have developed workshops which use creative research and imaginative questioning to open up unexpected ways of looking at the world. Past workshops include individual days at Norwich Castle Museum working with Foundation-level Art students, First Site Gallery for families, the British Museum for KS2 children working with astronomy, Radical Nature at the Barbican Art Gallery fo playgroups, and Kettle's Yard for children as part of Mr & Mrs Walker have moved. In 1997 I led several workshops at the Natural History Museum as part of my residency. These included photography and collage, creating dioramas, and explorations of taxonomy and naming. These workshops were for staff, children, schools and families. I have also worked with refugees, in prisons and on Creative Partnership and other projects with Primary and Secondary schools. In 2004 for the project Nature and Nation I ran a series of 4 workshops with the Cathedral School in Southwark based on creating a herbarium. This included collecting plant material with data, preserving, identifying and labelling, and making a glossary of Latin and Greek wordblocks which the children used to create new plant species names. Since 2003 I have been working as part of the freelance team leading workshops at the British Library for schools and other groups (age from reception infant classes up to 6th form, colleges, postgraduates and adult study groups). These cover my interest areas of language, the development of the book as object from scrolls to digitally stored information, and the nature of sacred texts. Following some workshops I did in June 2004 based on the Transit of Venus I was asked work with a science curator to develop an exhibition on astronomy and world cultures. As a result of this I was asked to develop workshops based on scientific thinking for the Nobel Prize exhibition last winter; these workshops were reviewed favourably in the Times Educational Supplement. I am currently leading workshops on Exploring the World's Knowledge, Questioning Texts, Sacred and public workshop tours of the Sir John Ritblat Treasures Gallery; I have also led tours of the Sacred Texts exhibition and the Henry VIII exhibition for groups of visiting academics, students, and foreign study-groups. 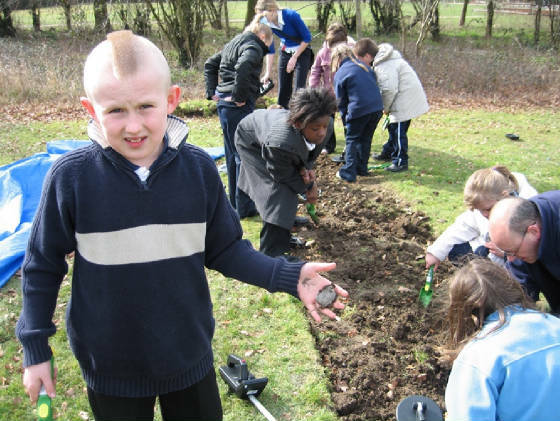 From 2006 to 2008 I worked on Lie of the Land, a Creative Partnerships project at Briscoe Nusery, Infant and Primary School in Basildon. I ran a number of activities here including a historical and museological project for the whole school, a mapping project with selected children, and a birdwatching project with nursery, Yr 1 & Yr 2, a history project with Yr 6, and a land art project with the entire school. The first project involved planting historical artefacts in the schoolfield where the children excavated them using metal detectors; the objects were then curated and identified by the children, who then used them as the core collection around which they are creating a museum in the school; over time I have introduced them to ways of researching to modify and sharpen some identifications, but the children have never been “corrected” in their interpretations. We have further developed the activities into story-telling, drama, and pottery-making using clay from under the school-field. 24hourmuseum website is also running a case-study on this activity. The children have developed their own research-skills as well as taking control of the design of the museum, and arranging the collections according to their own system. We developed the museum project outside the school by running it at a local open farm with another school, allowing peer-learning. CP commissioned a paper on the trade-off between KS1-2 engagement patterns and archaeological orthodoxy. The mapping project used the idea of an eighteenth–century estate map to use children’s drawings in a map of the school, which is being extended by the children into the surrounding community. I worked with Nursery to Yr2 children to make a bird-watching hide in the school field; we have also worked with staff and children to think about ways of protecting the school from vandals. Following a successful INSET day for staff at the Horniman Museum, we used Sepik River Masks and Native American war-bonnets as a model for creating power-objects to be used around the school to explore feelings of protecting "our" space. Year 6 curriculum work on World War Two was developed into the creation of an Anderson Shelter in a classroom, which the children took over as a "safe space" to explore their own traumas and fears, resulting in the children being more able to manage their own behaviour in class. As a Creative Partnerships project, these activities were continuously monitored and evaluated. The project was favourably reported in the 2008 Ofsted report on the school.